When choosing household cleaning products, I try to pick non-toxic, environmentally-friendly options as I prefer to limit my family’s exposure to known carcinogens as well as reduce the negative impact that we have on the environment. Although I acknowledge that it is not always possible to completely avoid exposure to carcinogens, seeing as we live in an urban society (and a polluted world), I feel that I should at least try my best not to introduce more toxins into our immediate environment as possible. When I became pregnant with Baby #3, I realised that I would have to be much more vigilant when checking the ingredients of our cleaning products, especially the floor and bathroom cleaners. Additionally, all the old and dusty baby things need to be taken out of storage and given all a thorough surface cleaning. So, at the end of last year, I was all ready (after much procrastinating) to begin researching some new eco-friendly brands when the kind ladies behind local online store, Ecobaby, got in contact with me to ask if I would like to try out the eco-friendly, carcinogen-free range of household cleaning products from ATTITUDE! After looking at the ATTITUDE company website, I decided to give their products a try, so Ecobaby was generous enough to send along a basic set of four cleaning products which I have been using since January this year. Apart from their carbon-neutral manufacturing and business practices, ATTITUDE products are biodegradable but made in an environment that ensures no contamination with known carcinogenic chemicals 1, 4-Dioxane (a solvent used during the manufacturing process of industrial chemicals) and Ethylene Oxide (a gas used during the manufacturing process for detergents and in the sterilising of medical and hospital equipment), which are commonly found in tiny amounts in everyday personal care and cleaning products. Of course, if you are checking product labels carefully, you may not find these chemicals listed as an ingredient, as they are not intentionally added, but exist as unintentional by-products or in very low concentrations as contaminants. This is why most government regulatory bodies will not require them to be listed as an ingredient although they are known carcinogens. My beef with eco-friendly cleaning products is that they tend be of such a mild and gentle (or weak) formulation that their actual cleaning power is greatly reduced unless they are used in extremely liberal quantities. However, this is not the case with the ATTITUDE cleaners which appear to be highly effective in small amounts. I have been using the cleaners for the last four months and there’s still plenty left! I especially like the Floor Surfaces Tile & Wood cleaner which I use almost daily by diluting it into a spray bottle. It gives my wood floors a nice shiny finish and has a really nice citrus scent…and it doubles very nicely as a toilet cleaner too when used neat. The Toy and Surface cleaner has also come in very useful for giving all the toys and our trusty cot-and-bassinet a through cleaning, and I use it on other surfaces in the children’s rooms – and I’m happy knowing that there will be no toxic residue left on the surfaces for Baby #3 to ingest when he starts putting everything into his little mouth. 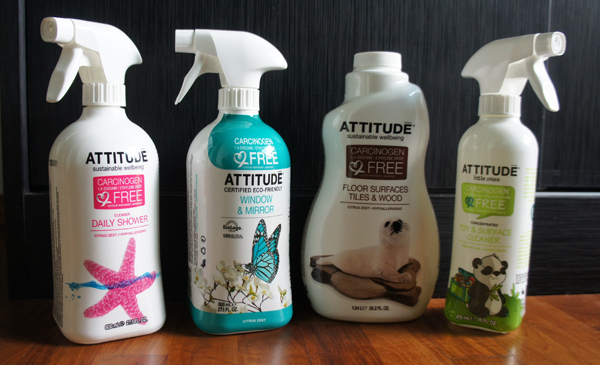 ATTITUDE also has a range of laundry products and dishwashing detergents which I haven’t yet tried out, but after seeing how well their other cleaning products have work for me, I wouldn’t mind giving them a go! A Becky Lee once purchased some ecofriendly laundry and dishwashing powders. Nothing got cleaned, and everything smelled of poo. Baby #3 is coming very soon and we are all agog with anticipation! I thought I would share with you some of the things that I have been using in order to get ready for the arrival of the baby! This post will be the first in a series of posts about preparing for the arrival of baby. Pregnancy is supposed to give a woman that ‘pregnancy glow’, which I highly suspect is merely the sheen of perspiration that I appear to be covered with for most of the day. My skin definitely does not glow. Pregnancy hormones have brought me dry hair, and it only stands to reason I am suffering from dry skin as well. Dry skin in pregnancy is pretty common, and most women will experience some skin tightness and dryness, especially across the belly as it balloons out more with each passing month. The stretching of the skin causes dryness and itchiness, which is awful to deal with because scratching will just aggravate and worsen stretch marks. I’ve also been getting random patches of eczema on top of it all, which has been most inconvenient. Apart from applying copious amounts of lotion, I have been on the lookout for moisturising body washes that would help with the eczema and the healing of broken skin, so I was very pleased when Curél contacted me and asked if I would like to try out their new foaming body wash from their Intensive Moisture Care range. I am literally itching to use this. I remember Curél as one of two brands of body soap that A Becky Lee used when she was a little girl growing up with sensitive, eczematous skin. At the time, the dermatologist advised my parents to avoid foaming or liquid body washes which are generally much more drying to the skin than bar soaps, so Curél slowly fell out of favour with my family. However, in the twenty or so years since then, Curél has developed a fragrance-free, alcohol-free skincare range for dry and sensitive skin which claims to cleanse without stripping the skin of its natural moisture barrier by adding moisture-retaining ceramide to their products. Ceramide is a naturally occurring lipid found in the outermost layers of our skin, and it has the special properties of being able to bind to water molecules, forming sandwich-like layers that create a natural barrier to keep skin hydrated. Keeping this natural barrier intact is also key to protecting the skin from external irritants which will exacerbate flare-ups. There is some evidence that skin problems like eczema and dermatitis are related to ceramide deficiency. This is why topical application of ceramide in the form of therapeutic lotions and cleansers has been shown to speed up the healing of mild-to-moderate eczema. The first time I used the Curél foaming body wash, I noticed that the skin over my burgeoning tummy felt much less tight and uncomfortable after my shower, and that the patches of eczema were noticeably less inflamed in appearance. Additionally, I love the luxurious texture of the fine lather which is so gentle on the skin – and both J and Little E really enjoy it too! It makes their skin feel very silky after a shower. We’ve all been using the Curél foaming body wash for over a month now and one pump or two of foam really goes a very long way. I am very pleased to report that after a few weeks of using the body wash in conjunction with my usual moisturising regime, the patches of eczema have healed up very nicely! Hooray! 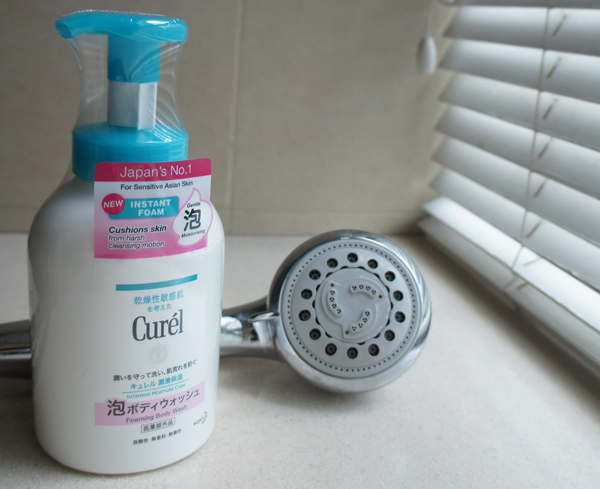 A Special For Owls Well Readers: Curél Singapore is very generously sponsoring one bottle of Curél Foaming Body Wash to FIVE lucky Owls Well Readers! Thank you Curél Singapore! Like and share this post on your Facebook Page and tag three friends – make sure your post is public! If you would like to try a sample of products from the Curél Intensive Moisture Care range, you can visit the Curél Singapore Facebook page here. Otherwise, you can find Curél products at Watson’s and Guardian stores across Singapore. Update: This giveaway is now closed and the winners have been contacted via email. Thanks for playing! I did not go to work today. 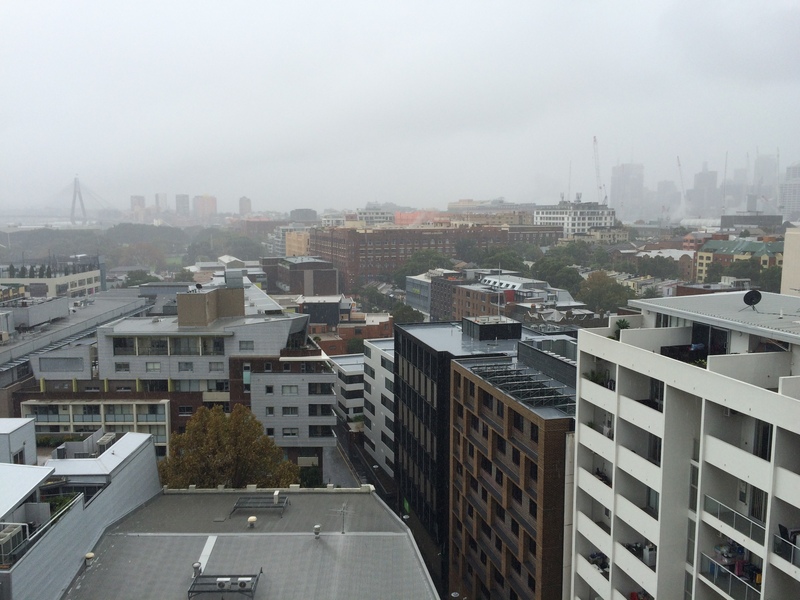 This is not because I am sick or otherwise incapable, but because the outside of Sydney looks rather like the inside of a washing machine. Y’know, because of the cyclone. The rain has been pelting down heavily since this morning and, with winds of up to 130 km/h, sometimes pelts sideways rather than down. The roads have flooded, some coastal areas have had homes washed away and some boats have been unable to dock at harbour because of the height of the waves. The NSW Premier has actually told us not to undertake any non-essential travel and made a call for employers to be a flexible with employees today, as the roads are pretty dangerous. The last time I went out (to work yesterday), I was soaked to the bone and blown about like a leaf after my umbrella turned inside out. Thankfully, I’m pretty safe here in my city-bound home, though I did receive a warning from my workplace not to come in as trees were falling down on cars. 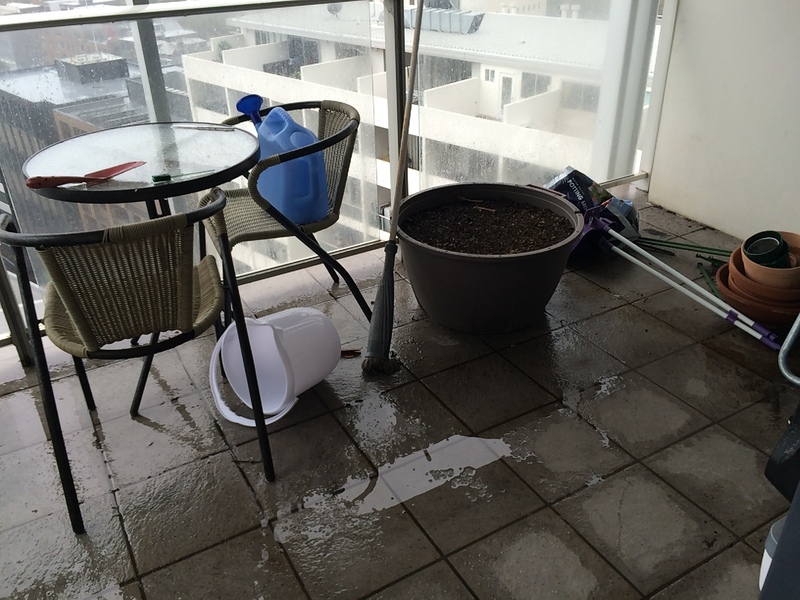 Still, there’s a lot of work to do here, as the wind has blown all the things on my balcony about, so I’ll have to tie it all down with a tarp. We like to keep busy – but not too busy! 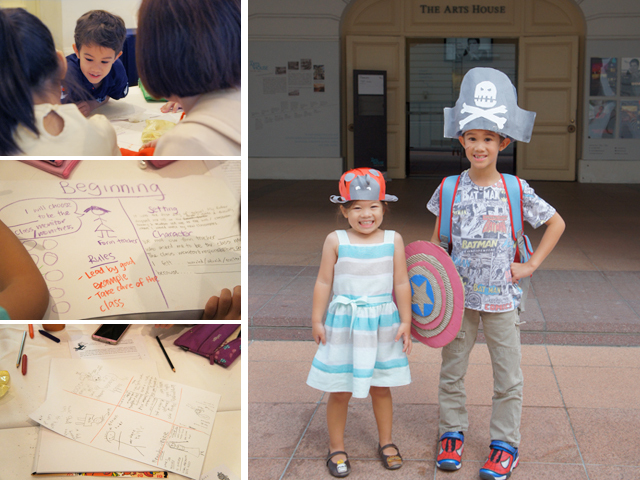 There’s a plethora of enrichment classes available for children in Singapore and a temptation in Singapore to cram as many activities into a child’s weekly schedule as possible. I think it is very easy to get carried away when choosing enrichment classes because of our innate desire as parents to provide as many opportunities as possible for our children to learn, grow and become well-rounded individuals. However, I believe that it is important for my children to have some free time because not only can they relax during this time but it also gives them a chance to develop their imagination and creativity. 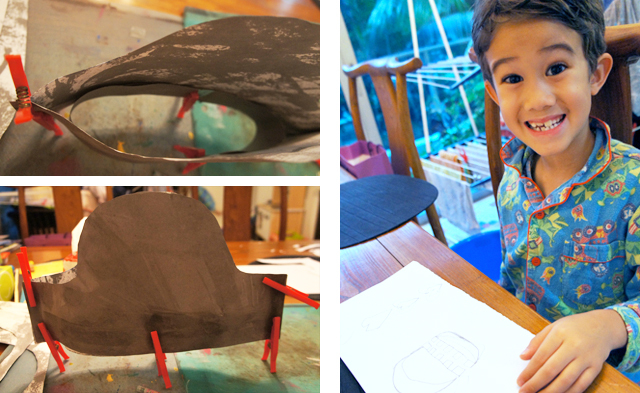 Children who have free time will learn to keep themselves gainfully and meaningfully occupied. They will rarely complain of boredom as they are not dependant on someone or something else to entertain them every second of the day. We like to choose activities that tend to fall into more than one of the above categories. As soon as both J and Little E have been consistently able to follow instructions, we have taken them for swimming lessons. This is because we consider swimming and water safety as an important life skill, especially in Singapore where there are open swimming pools, reservoirs, fountains and canals everywhere. It is also a sporty activity from which they can get plenty of exercise and there is opportunity for them to swim competitively if they have the inclination. 2. Enrichment classes should help develop character weaknesses or encourage personal strengths and interests. When I was in primary school, I tended to skulk about in corners and mumble when spoken to. My parents wanted me to be more certain of myself, so I was packed off to speech and drama lessons for a few years. This helped me to develop stage presence which is a very handy thing to have, not just for giving presentations or managing the occasional job interview, but on a daily basis. It was especially useful when I was still active in the field of medicine where one has to communicate well and command respect and attention from patients and families. We want J and Little E to be confident individuals who carry themselves well and are not afraid to express themselves in public. However, we also want them to be self-controlled and disciplined. With this in mind, we allowed J to learn martial arts and enrolled Little E in ballet lessons as both of them have expressed an interest in these specific fields. For J, learning wushu is less about self-defence and more about wushu as a performing art or competitive sport. Additionally, he gets a chance to practice his mandarin with other children during the class, and stimulate his interest in Chinese culture. He is a very active little boy so wushu is a great physical outlet that enhances his natural hand-eye coordination skills, and helps him to build confidence whilst developing much-needed self-discipline and emotional control. This is pretty much same for Little E, who is really enjoying her ballet classes. Dance is both a performing art and a sport, a gateway to other forms of dance and self-expression. We have been told that ballet gives a good foundation in self-discipline, musicality and personal poise! 3. The lessons do not repeat what is taught as part of the school curriculum. We believe that in order to cultivate a lifelong desire to learn, children need to be encouraged to seek out information independently and not have it constantly forced into them from outside sources. If we find that our children are particularly interested in an academic subject or they want to understand more about a topic that is not covered in the school curriculum, then we would prefer that they do their own study and research. We support their search for knowledge by providing access to reference texts and DVDs, finding appropriate online learning resources, and bringing them to the public library. We think that the current school curriculum is more than adequate and there is no need for our children to attend hothouse classes in order to be ahead of the school’s set lesson plan. It would be a foolish waste of our children’s precious time to sit through the same lesson twice. If we personally felt that the school curriculum is lacking and that our children would receive a better education via hothouse programmes, then we would not bother wasting time sending them to school. 4. The lessons cannot be taught by ourselves at home. We would only consider sending our children for academic-related classes if they were struggling to keep up with the school curriculum and need extra help which neither the Barn Owl nor myself can provide. Both J and Little E attend after-school mandarin classes regularly as our ability to encourage them in this area is extremely limited . However, we tried our best to find a mandarin class that encourages and maintains their interest in learning and using mandarin, without too much emphasis on scholastic achievement. In the end, it is more important to us that they develop a love and appreciation of the language than achieve top marks in class. There are other classes in the realm of aesthetics and sports, such as art and craft or badminton, which the Barn Owl and I can teach them as part of our family recreational time, so we do not feel the need to send them for formal lessons on a regular basis. However, if our kids happen to show an aptitude in one of these areas that is beyond our ability to nurture, then I suppose we would consider hiring a coach or a tutor who is formally trained to guide and mentor such budding genius! 5. The activities do not infringe on family time. Family time is precious and we guard it very jealously. Evenings and weekends when the Barn Owl is likely to be home from work and we are together as a family are very strictly out-of-bounds so the children are not allowed to attend classes during these times. The only exception we have made to this rule is for swimming lessons, which are on Sunday afternoons. All of us will head to the swimming pool together for an afternoon of splashing and playing before and after the actual lesson, so the lesson itself doesn’t affect our family time in the slightest. 6. The ultimate goal of the activity is to instil lifelong hobby or interest. I know that there are many parents in Singapore who have already sent their preschoolers for coaching in sports and activities like football, badminton and chess, in the hope that they will eventually be selected to join school teams and gain entry into elite schools! This is NOT our goal for J and Little E.
We like to choose activities that will have longevity, and it is even better if the hobby can not only be enjoyed on an individual basis but also as part of a group or team. J is currently learning the violin, which is an instrument that can be played solo as well as as part of an ensemble. Violin is also a small portable instrument that he can take anywhere in the world with him. Although learning an instrument is difficult (and occasionally stressful), we hope he will grow to love it and see the violin as an extension of himself and a vehicle for creative expression. We have also decided not to send our kids for classes in sports that are only team-based (such as football) or require more than one person in order to play (such as badminton or tennis). Although it’s good for children to learn teamwork and good sportsmanship, we do not think it is necessary for them to receive formal coaching in a team sport – we will probably encourage them to join their school clubs or recreation clubs instead. 1. The limiting factor for advancement in the class is dependant on the developmental stage of the child. When J was 6 months old, we started baby swim lessons, which he really enjoyed. However, after a year, we realised that for a whole term, he did not make any progress because he was limited by his ability to follow verbal instructions. So we decided to cease swim lessons and restart them when he was older. 2. The class no longer appears to achieve its purpose/has completely achieved its purpose. We used to send J for mandarin speech and drama lessons, in the hope that it would encourage him to be more confident in speaking mandarin. 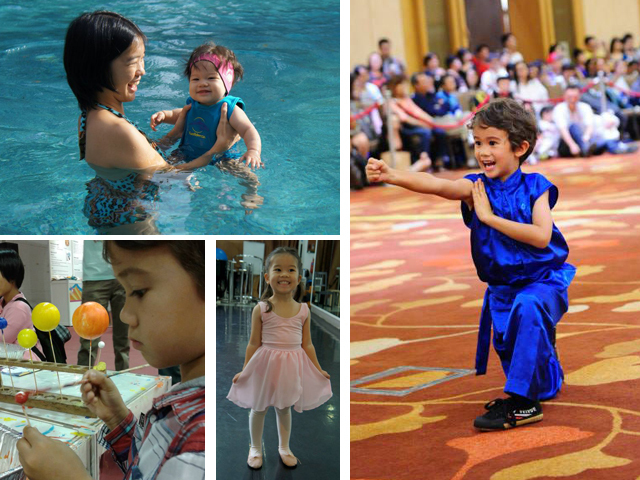 At first, we saw a dramatic improvement in his willingness to speak mandarin and engage with his Chinese teacher in school, and at the end of year class performance, we were proud to see J happily singing chinese songs and reciting chinese poetry together with his classmates. However, at the end of his second year in the class, we observed that at the end of year class performance, even though the overall standard of the performance was higher than that of the previous year, only a small handful of children was given a speaking role, whilst the rest of the class repeated the same four word phrase over and over again. We knew then that the class has exhausted its ability to nurture J further, so we decided to enrol him in a different Chinese school. 3. The class makes the child miserable. I used to enjoy ballet lessons as a child, until my ballet teacher told me that my legs were ‘too crooked’. This comment was not meant to encourage me to improve my posture or leg position, but was a criticism of my actual bone structure, which is something that I knew I could not change. The criticism from my beloved teacher hurt me so badly that I began to drag my feet to class. Fortunately, my parents were perceptive enough to understand that my reluctance to attend ballet lessons did not stem from laziness or lack of tenacity. They stopped the lessons and did not force me to continue learning dance, even under a different teacher as they recognised the negative impact that the classes were having on my psyche. There is no point in continuing a class that has an overall negative effect on a child. Even though a child may appear to excel in that discipline, if he or she despises the subject and derives no joy from it, not even the satisfaction of achievement, then being forced to continue will bring no long-lasting benefit. It is pretty clear when a child is only doing something to please his or her parents and for no other reason. Barn Owl is British and his mandarin vocabulary is one (he can say “pain” in mandarin), and I only speak Windmill Chinese. Although J isn’t having a Crazy Hat Day at his school, he really wanted to make his own paper hat as well, after seeing Little E’s ladybird bug hat. 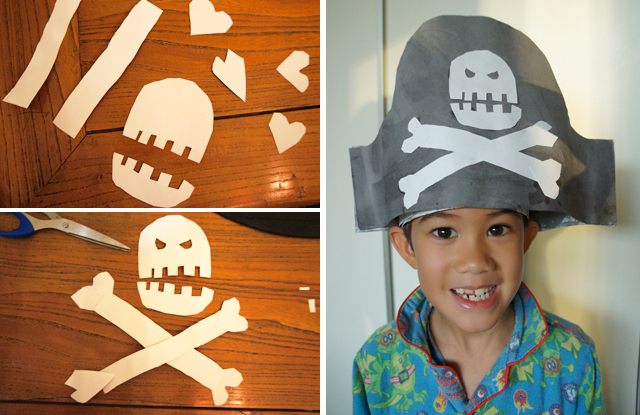 Since he’s been reading some pirate-related literature (namely, How to Train Your Dragon: How to be a Pirate and Pirates from the Horrible Histories series), he decided that he wanted to make a pirate hat! 1. From each sheet of black paper, cut out a 1.5-2 inch strip of paper from the longest edge of the paper and tape this together to make a circular hatband. Adjust this to fit your child’s head. 2. Cut out the shape of the pirate hat from the two sheets of black paper. 3. Using glue or tape, fix the front and back of the pirate hat to the hatband. We used a dab of PVC glue and clothes pegs to hold the hat band in position. 4. Glue or tape the two left and right edges of the pirate hat together. Again, we used PVC glue and clothes pegs for this. 5. On a sheet of white paper, get your child to sketch out the following shapes: four hearts, two long rectangles, one large semicircle and one small semicircle. These will form the skull and cross bones on the pirate hat. On the flat sides of the semi- circles, draw four or five squares or rectangles (to represent the teeth of the skull). 6. Using scissors, cut out the shapes from the white paper and assemble them as shown in the picture above to form the skull and crossbones. 7. You can draw eyes in the skull using black marker or cut two holes out of the skull using scissors. 8. Glue the skull and crossbones to the front of the hat. 9. If your pirate is a bit of a dandy, you can decorate the pirate hat with feathers, sequins or strips of coloured cloth! 10. Practice your best pirate voice! ARRRRRRR! International TableTop Day is this weekend on the 11th April 2015! We here at the Owls Well branch in Singapore are big fans of boardgames – it’s such a great way to get all the family together and focussed on one activity. Quality time rocks! J and Little E love playing games with us so much that we made a series of videos last year showing how preschoolers can enjoy playing strategy games together with mum and dad. J wants every family to play games together. So here’s some fun videos of us playing our top 3 favourite games of 2014, hosted by J! 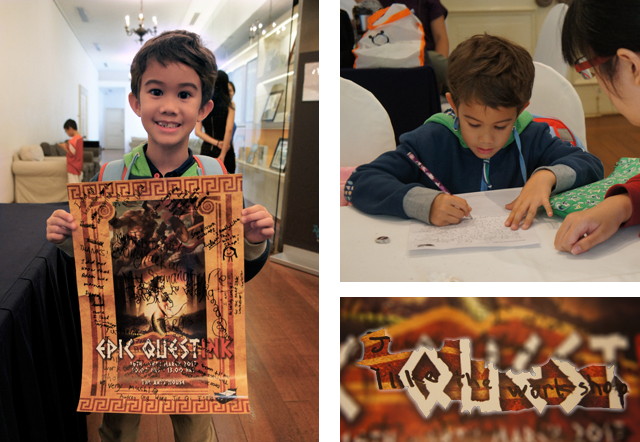 If you would like to join in International Tabletop Day and find out more about some awesome games, you can join in these events that will be happening around Singapore this Saturday! Everyone is welcome and you can even bring your own games along (but you probably need to RSVP to the links so that they know how many chairs to put out). P.S. We bought Forbidden Island and Munchkin Deluxe off Amazon (but those games are not eligible for international delivery anymore) and Castle Panic from My First Games. I highly recommend checking out My First Games, which is run by my mumpreneur friend, Pamela of Tan Family Chronicles! She has a great selection of games for all ages which are also very competitively priced and you can get all the games featured in our videos from her.